New York’s Socrates Sculpture Park and The Architectural League of New York have announced the winner of their annual Folly/Function competition. This year’s winning proposal comes from Brooklyn-based firm School Studio, which has designed a small steel kiosk. 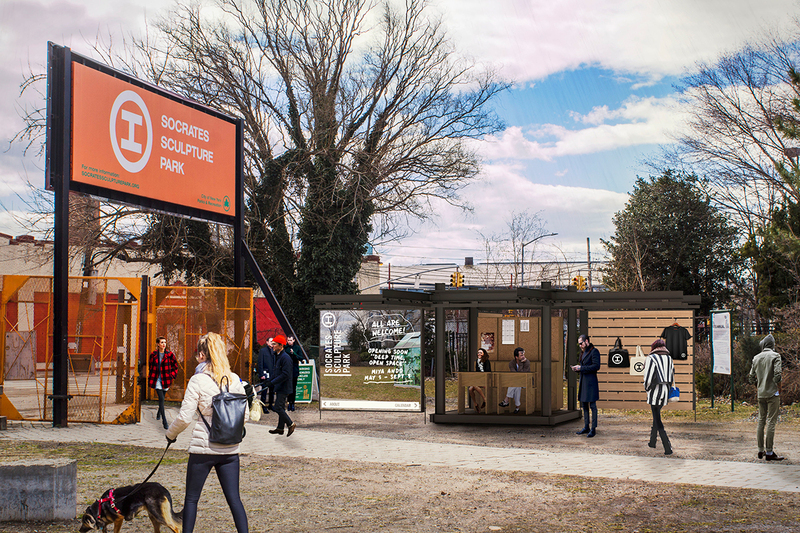 Judging from the released rendering, the pavilion will be more functional than those of past years; apparently, it will operate as a sort of information kiosk with branded Socrates Sculpture Park goods. The design imagines a small steel-framed box with enough room inside for a couple of people to sit. The exterior walls are able to slide out from the surface of the kiosk, cantilevering off the structure as signs or banners of sorts. When the walls are retracted and tightly wrapped around the structure, the “mirrored doors of the kiosk” make it so the pavilion “melts into the scenery,” according to a press release from the competition organizers. Last year’s winner was Ithaca-based firm HANNAH with its suite of 3D-printed concrete furniture. The pavilion will be open for visitors at the Socrates Sculpture Park starting June 17.